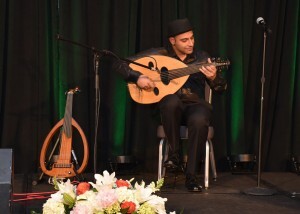 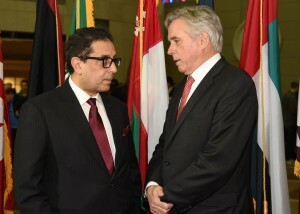 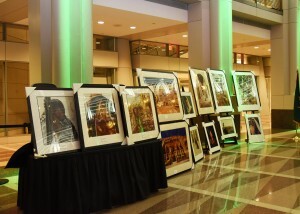 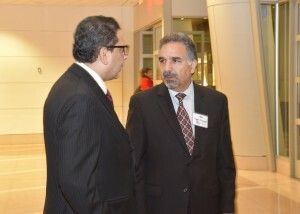 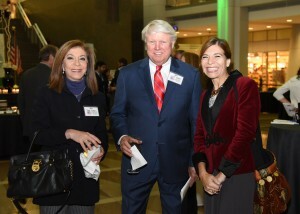 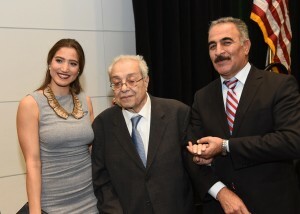 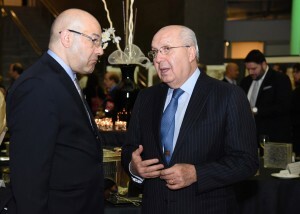 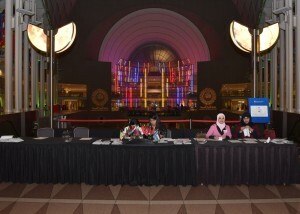 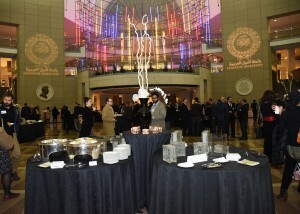 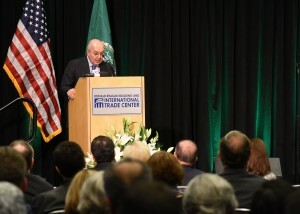 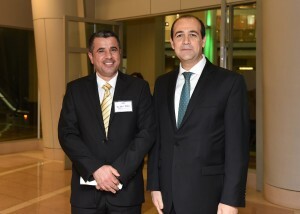 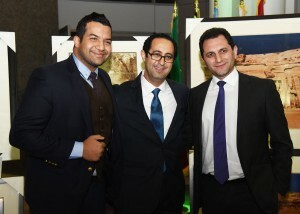 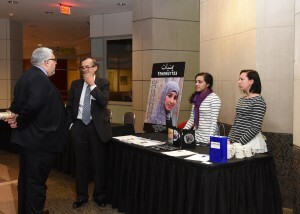 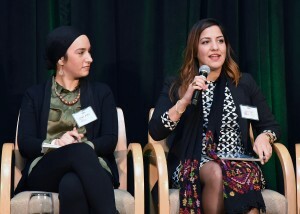 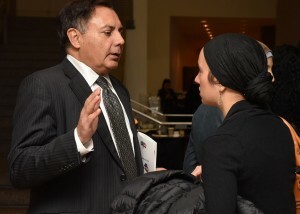 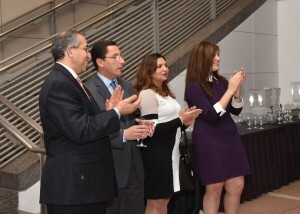 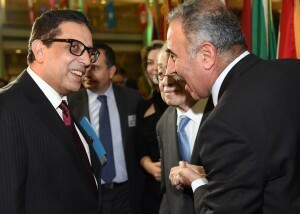 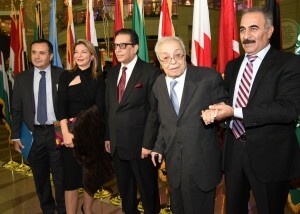 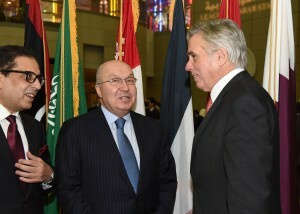 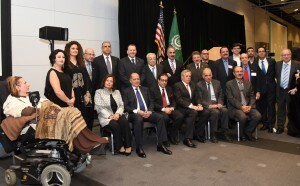 Under the Auspices of the Council of Arab Ambassadors in Washington, D.C. and in cooperation with the National U.S.-Arab Chamber of Commerce (NUSACC); The Arab League in Washington, D.C. organized the fourth Annual Arab -American Day on December 4, 2015 at the Atrium of Ronald Reagan Building & International Trade Center with the First forum on U.S.-Arab Entrepreneurship and Innovation that took place from 1:00pm till 6:00pm. 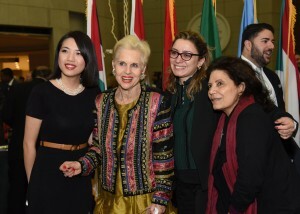 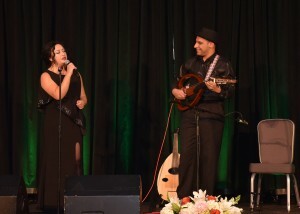 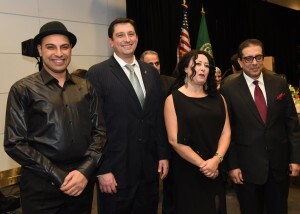 The Forum panels were followed by the Arab-American Day Gala reception with remarks from distinguished speakers, and ended with opera and music performance with a selection of international opera and oriental music. 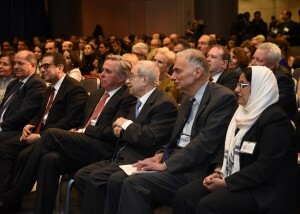 R-L : David Hamod President and CEO of NUSACC , Ralph Nader, Ambassador David Thorne, Ambassador Antoine Chedide, Andrew Gelfuso , VP of Ronald Reagan Building and International Trade Center and Sameh Alfonse , Deputy Chief Representative of the Arab league in Washington, D.C.
R-L: Ms. Nahla Al-Jibeir from SACM , Ralph Nader , Keynote speaker on behalf of the Arab-Americans, Ambassador Clovis Maksoud former head of Arab league in the USA, Ambassador David Thorne , Senior Economic Advisor to Secretary of State, Ambassador Salah Sarhan , Chief Representative of the Arab league in DC, Ambassador Ahmed Fath-Allah of the Arab League delegation to the U.N> in New York and Ambassador Wafaa Bogeigeis of Libya in D.C. 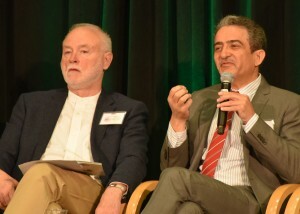 The Entrepreneurship & Innovation Forum brought together 35 Experts & key stakeholders to discuss ways to improve Arab innovation and the entrepreneurial ecosystem in the Arab World & Middle East and North Africa (MENA) region. 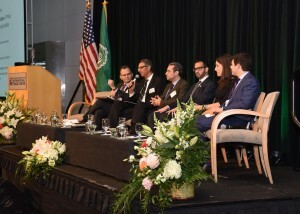 The Forum featured speakers and panelists, from the MENA region and around the United States including senior officials from the U.S. Government: Hon. 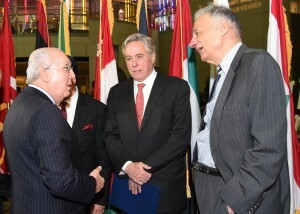 David H. Thorne, Senior Advisor to the U.S. Secretary of State; Mr. Thomas Lersten, Director of Global Entrepreneurship at the U.S. State Department; Mr. Thomas Debass, Deputy Special Representative for Global Partnerships at the U.S. State Department; Mr. Bert Kaufman, Senior Adviser to the Secretary of State’s Office for Business Liaison and Co-Director of the Presidential Ambassadors for Global Entrepreneurship initiative; Mr. Joshua Mandell, Senior Adviser for Innovation and Competitiveness at the U.S. Department of Commerce; and Ms. Sarah Heck, Director of Global Engagement at the National Security Council. 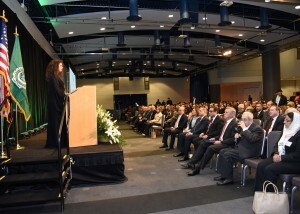 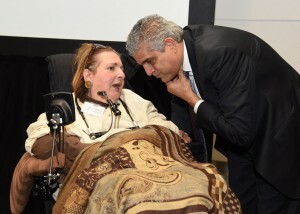 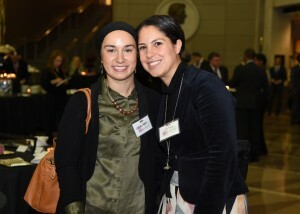 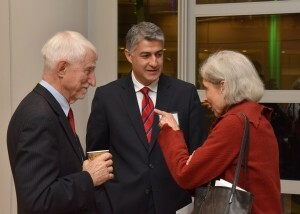 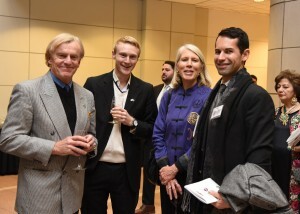 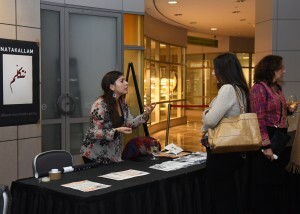 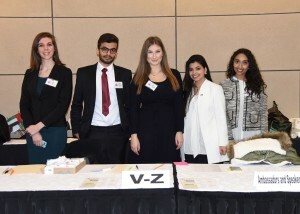 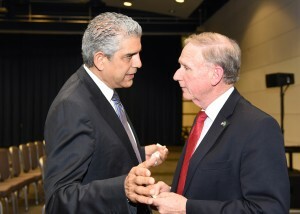 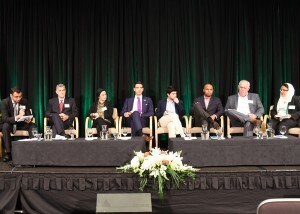 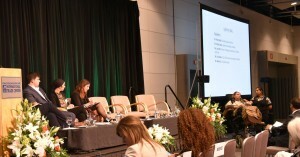 The event drew nearly 600 participants, including numerous business leaders, Arab diplomats, and such Arab-American luminaries as Ralph Nader, the world’s best known consumer safety advocate. 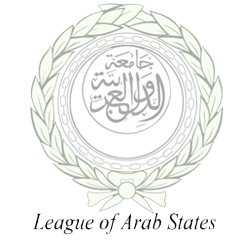 Arab American Day was the first public event organized under the leadership of the Arab League’s new Chief Representative to the United States, H.E. 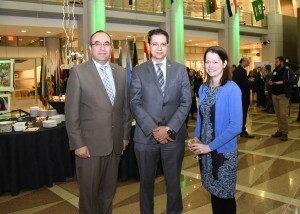 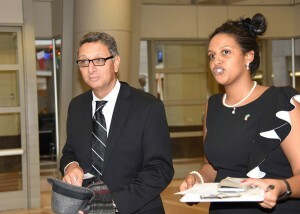 Salah Ahmed Hamed Sarhan, who began his tenure in Washington, DC in mid-November. 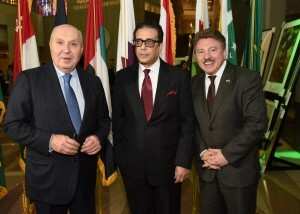 L-R : Ambassador Antoine Chedide of Lebanon, Ambassador Salah A. Sarhan of the Arab League and David Hamod , CEO and President of NUSACC. 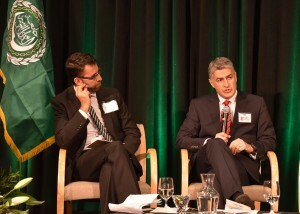 First Panel of the forum : Trends of Entrepreneurship at Middle East and North Africa: L-R: Paul Salem , Vice President of MEI, Khaled Ismail , President of KIAngel investment in Egypt, Firas Ben Achour , President of Tunisian -American Young Professionals, Saud Al-Nowais, Head of Trade and Economy at UAE embassy in D.C., Sarah Hecks , Director of Global Engagement at the White House and Burt Kaufman Co-Director of PAGE and senior adviser at Secretary’s office DOC. 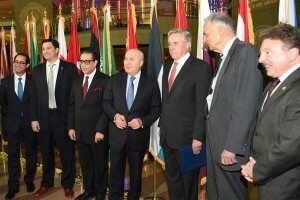 Left Photo below : American-Jordanian Photographer Lily Bandak , Lubana Al-Quntar and Hazami barmada with AMbassadors of Iraq, Palestine, Tunisia , Libya and the Arab league. 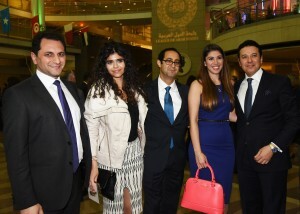 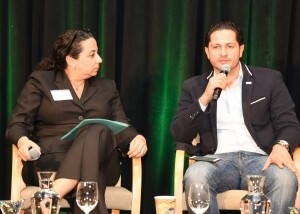 1- Dr. Dimah Mahmoud , Forum Manager and Khaled Ismail, President of Endeavor Egypt. 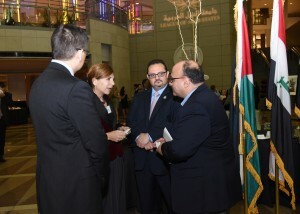 6- Mohammed Barakat , U.S-Qatari Business Council, President and Sanaa’ Bagersh, Tamakkan Founder and Board member AmCham Dubai , with Tom Lersten, Director of Global Entrepreneurship , U.S. State Department at closing panel. 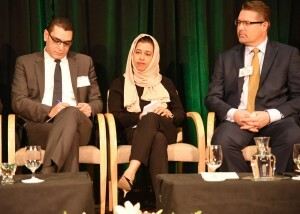 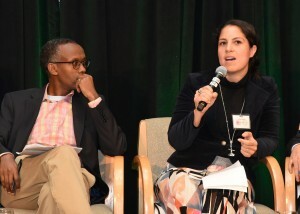 8- Thomas Debass, Deputy Special Representative for Global Partnerships , U.S. State Department , Dr. Mona Mowafi , RiseEgypt , Cofounder nad President and Abdulrahman Al-eryani, Economic and Commercial officer , Yemen Embassy in USA at the Panel on the role of private -public sectors in facilitating entrepreneurship. 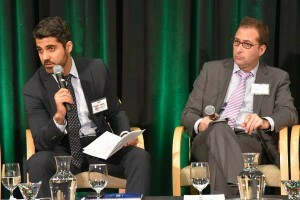 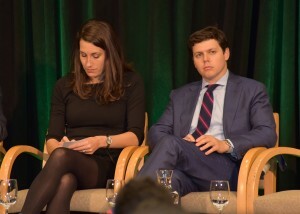 9- Hamada Zahawi, International Attorney Adviser, Department of Commerce and Joshua Mandell, U.S. Department of Commerce , Senior Adviser for Innovation and Competitiveness at Panel on Public-private sectors role. 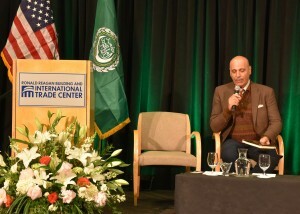 10- Aziz ABou Sara, Executive Director of Center for World Religions, Diplomacy and Conflict Resolutoin moderating a small group discussoin on Fostering Innovatoin From Educatoin to Job Creation. 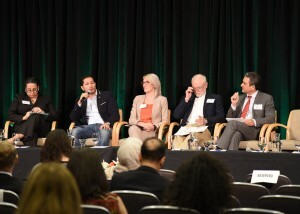 moderating , with Wissam Yafi,(Lebanese -American) Founder of TidWit, Lena Alfi, MECI, Director of Startegic Partnerships, Mohamed Abdel-Kader, Deputy Assistant Secretary , U.S> Department of Education, Sami Hourani, M.D. 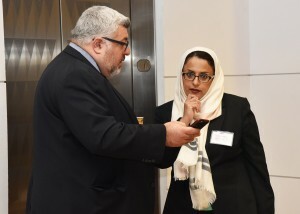 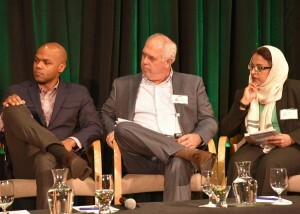 , FORSA founding CEO, Nasir Qadree, Village Capital, Head of Education, Steve Buckley, Bangrang Enterprises, CEO and Nahla Al-Jubeir Saudi Arabian Cultural Mission , Director of Center for Career Development. 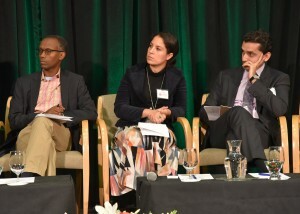 11- Tools for development Panel on entrepreneurship and social issues: Moderator Maya Berry and Ahmed Ashkar with Ainsley lloyd, Global Entrepreneurship & Development Institute , Next Photo: Dr. Curt Rhodes, Questscope , Founder and International Director and Rafiq Masri, Chairman of Paleco. 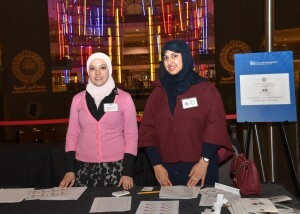 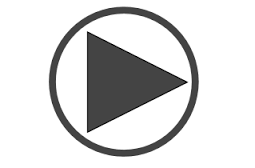 12- Lightning Talks : Lena Alfi with Rasha Ali, FeeKash Co-founder . 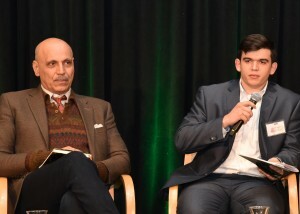 Andy Shallal of Bus Boys and Poets with John Satary, Nue Medical Consulting, Founder. 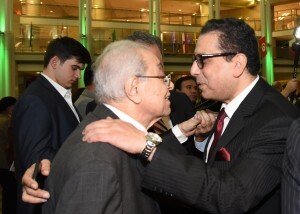 13- Ambassador of the Arab League Salah Sarhan together with Andrew Gelfuso of RRBITC welcoming and congratulating Lubana Al-Quntar and OUD composer and player Ramy Adly. 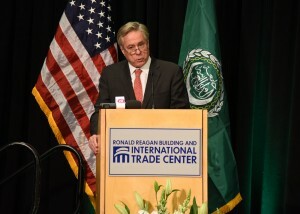 15-Ambassador David Thorne, delivering his remarks on behalf of Secretary John Kerry. 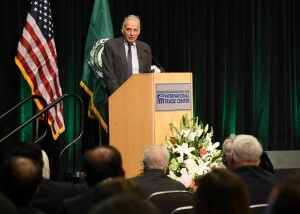 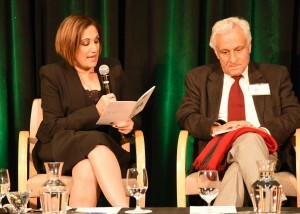 16- Ralp Nader speaking to the 600 guests , with his decades of experience and activisim in civil and consumer rights. 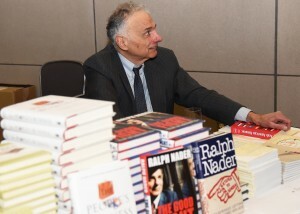 17- Ralp Nader book signing. 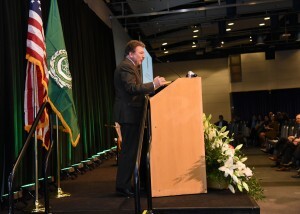 18- David Hamod of NUSACC delivering closing remarks. 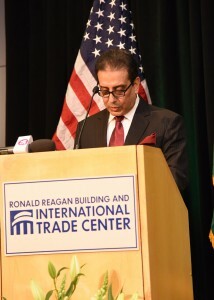 The Ronald Reagan Building and International Trade Center – Washington, D.C.